Companion Animal Foundation recently made another trip to pick up dogs from Oakland Animal Services for the Little Dogs, Big Love program. 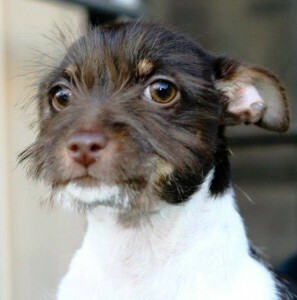 Flora is a three-month-old Chihuahua and Terrier mix, and she is a heart stealer! She loves people and other animals. She is energetic and playful but is also content cuddling in your lap for hours. Flora sleeps perfectly in a crate and is making great strides in potty training. CAF would love to bring more dogs to Humboldt, so please consider fostering and giving dogs a better chance to find their forever home. 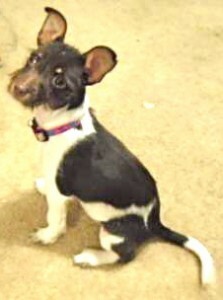 For more information on adopting or fostering please call (707) 826-7387, or visit cafanimals.org. 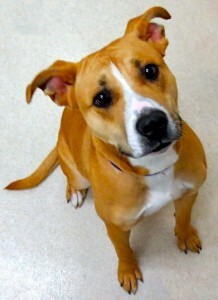 Lady is a tan and white Pit Bull Terrier mix. She is a good-natured, playful dog, happy to be around people or other dogs. Lady knows a few commands and is very eager to learn more, especially if there is a treat involved! She is one year, one month old and has been spayed. She arrived at the shelter on November 29. Her ID number is A062126. 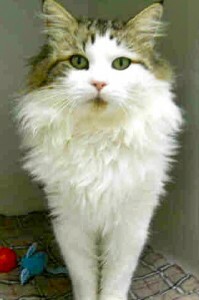 Marbles is a white and brown tabby domestic longhair. He is six years old and has been neutered. He arrived at the shelter on November 19. His ID number is A062065. For more information about Lady or Marbles, call the Humboldt County Sheriff’s Animal Shelter at (707) 840-9132 or visit petfinder.com/shelters/CA866.html. Animal Arcata is sponsored by Arcata Pet Supplies. Compiled by Asti Morris, Helen Tozer and Mara Segal. This entry was posted on Tuesday, January 8th, 2013 at 11:14 am	and is filed under Animals. You can follow any responses to this entry through the RSS 2.0 feed.